I can’t really explain why eating at a food truck is so exciting for me. Maybe it jingles distant bells of the Good Humor man pulling up in my neighborhood. Sometime I think the very transient nature of the truck itself is the key. When I have to yell up my order to an open window, I am halfway home. Food trucks seem like a modern invention, but they are far from it. Most early diners started as railway cars. For decades, humble food carts in town squares in New Mexico sold the best tamales in the state. I recall with pleasure the authentic roadside Navajo fry bread in Arizona. How thrilling is was to learn that on weekends, parking lots in Northern California are taken over by food trucks serving marinated tri-tip steak sandwiches. If you are on the road during the sweltering summer, nothing is better then cold cherry cider from a roadside stand in the Upper Peninsula of Michigan. I would say that Ridgefield’s Zawack Shack looks more like a bus (a big bus) then a truck. Again I have to give credit to my neighbor who cuts my lawn for finding Zawack. He has impeccable taste, and instead of mowing grass he really should be the food editor of The New York Times. His radar is that good. Zawack specializes in hot dogs and hamburgers, which in itself is no big whoop. Obviously, there is no shortage of places to eat burgers or dogs in southern Connecticut, but I applaud Zawack Shack for doing them so well and with such imaginative variety. The burgers are “man sized" fist-thick patties on a big yeasty bun. 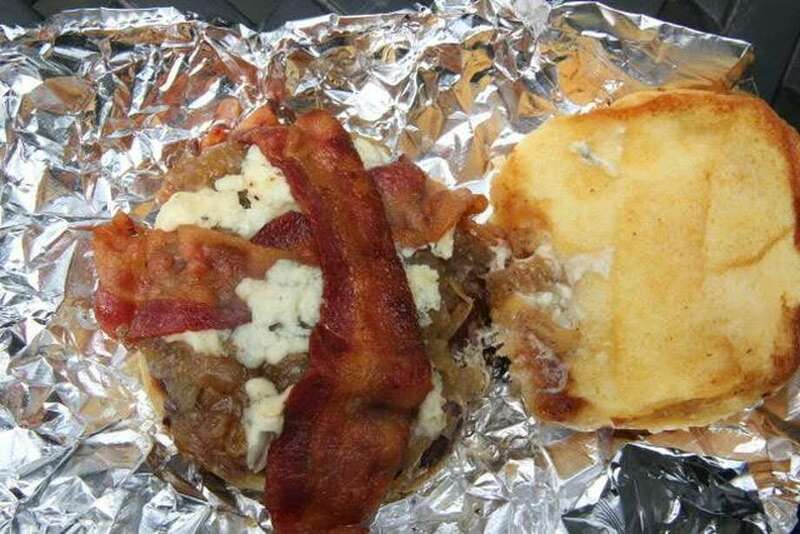 My favorite one is the Blue Cheese Burger with bacon and grilled onion. As I often do at hot dog places, I order a plain hot dog, nothing on it. Just as you can put lipstick on a pig, if you plop enough condiments on a mediocre tube steak it will looks appetizing. My sparse hot dog did not disappoint. It was a high-quality dog made by Hummel Bros. in New Haven. Zawack also sells a big fat juicy kielbasa and a lesser-known white hot dog made in Rochester, N.Y., where they are a beloved tradition. Zawack makes a mind-blowingly good pepper relish and a spicy horseradish sauce. Posciutto is kept on hand to complete a dish called the Italian Filly, which also includes the pepper relish and provolone. The menu specials change daily. The names are fun to read. I liked the James Bondian “License to Kielbasa.” The very scary sounding “Stick of Dynamite” is composed of a special spicy fried hot dog that is topped with chili, jalapeños and ghost pepper flakes. Spuds Mackenzie is a mix of tater tots and tater cones topped with chili, cheese and onions. Fried hot dogs (called rippers in New Jersey) are so good because frying is the best way to cook a hot dog. If you have only tasted boiled “dirty water” hot dogs, you are in for a treat. I learned about rippers from my old friend Martha Stewart, whose taste in hot dogs is as perfect as everything else in her kingdom. On their Facebook page are pictures of fried onion rings, yet they are not mentioned on the web menu. Whenever I see a commercial onion ring at a cool place like Zawack’s, I want to cry and here is why. My favorite O rings were made at Dog Daze, a roadside stand a few miles south of Zawack. They were perfection. The day the place opened for the summer after Memorial Day the owner told me that the board of health had made him substitute frozen commercial onion rings for his hand-crafted ones. That, dear reader, is where our tax dollars are going. I guess real, made-from-scratch onion rings are right up there with terrorism and gun control. I applaud Zawack Shack for always being there, rain or shine. They don’t have to, they have wheels and can scoot away, but they know hungry people need continuity in their lives. I say this because there is one very popular food truck that has been on my review list for a year. It is not only next to impossible to know where they will be but three times this month I was “stood up”… one among many customers looking fruitlessly for the phantom truck. This coy fickleness may keep a romance steamy, but it doesn’t work for lunch.